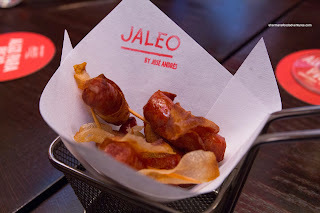 To go with our vino, we got a few items to share starting with the Chistorra Envuelta En Patata Frita (slightly spicy chorizo wrapped in crispy potato). These small bites were pretty good consisting of meaty chorizo which was only a touch spicy, as advertised. The thin potato wrapper only covered part of the sausage and added a light crunch. 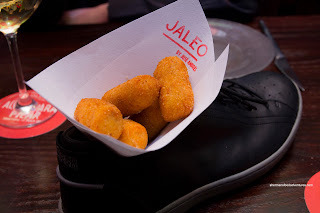 While we were waiting for our second item, we noticed a server carrying some shoes on his platter. Snake remarked, "are they serving sneakers now?". Well, indeed they were because the Croquetas De Pollo arrived in... you guessed it, a sneaker. Not to worry, there was no musty odor nor strange flavours. These chicken croquettes were lightly crispy on the outside which yielded to creamy interior that tasted strangely like cream of chicken (in a good way though). Next up was another chicken dish being the Pollo A La Parrilla En Su Glasa Con Aceite (grilled marinated chicken served with garlic sauce). Although charred nicely with a smoky essence, I found the chicken to be rather dry and lifeless. It was flavorful though, yet one note in flavor being quite salty. This was probably my least favorite dish of the meal. Dining on tapas is generally an unfulfilling proposition due to portion size, so a small serving of mussels only compounds the problem. Sure, it looks impressive, with shell and all, but in reality, there is very little to eat. 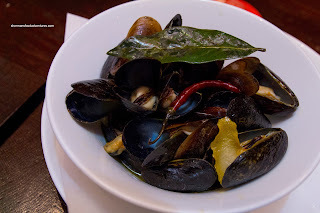 The Mejillones Al Vapor (steamed mussels with bay leaf, lemon and olive oil) was just that. With that being said, it was prepared nicely though. The mild broth was not all that noticeable, but the lemon did come through as well as the slightest of spice. It must be noted that the mussels were barely cooked which helped retain a nice texture and natural sweetness. 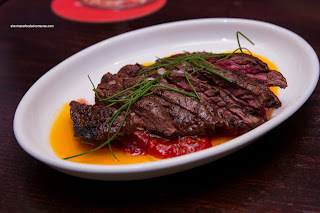 Onto something more substantial, we had the Carne Asada Con Piquillos ‘julián De Lodosa’ (grilled skirt steak with piquillo pepper confit. The steak was grilled a beautiful medium-rare and was sufficiently tender. The pepper confit added plenty of flavour in the form of tart and sweetness, yet once again, they were a bit heavy handed with the salt. 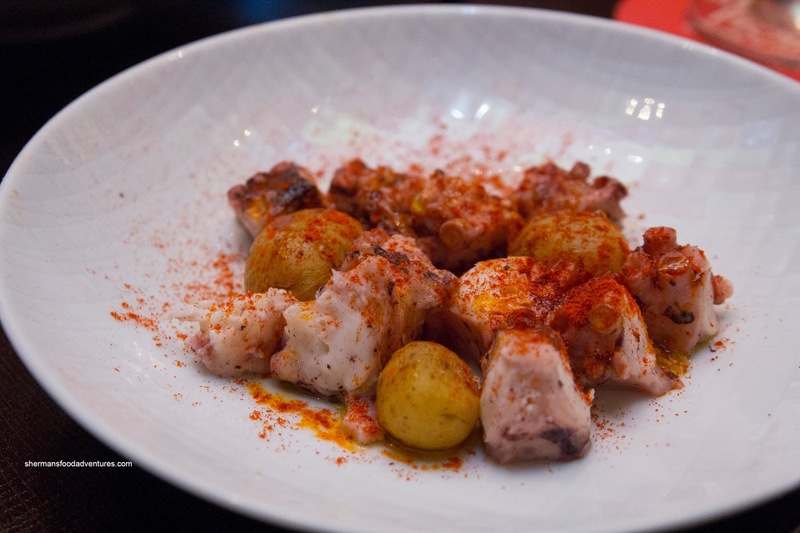 The Pulpo A Feira Maestro Alfonso was much more mild consisting of boiled octopus with pee wee potatoes, pimentón and olive oil. 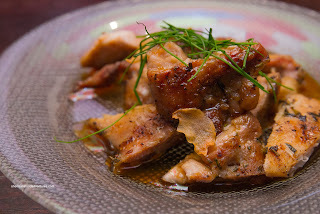 The small morsels of octopus were tender while maintaining some chew. As mentioned, there was only a modest amount of seasoning, which helped highlight the natural sweetness of the octopus. Despite the aggressive dusting of paprika, it did not really impact the flavours. I really liked the pee wee potatoes as they were soft, yet not mushy. 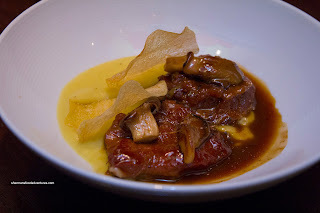 For our last dish, it was a whopping $26.00 for a small dish of Fricandó De Carilleras De Ternera Y Puré De Patatas Al Aceite De Oliva or veal cheeks and morels with olive oil potato purée. Definitely quality over quantity as the meat was melting tender. The rich, silky sauce had depth while the smooth puree was smooth and sinful. This was very good, if not completely overpriced. 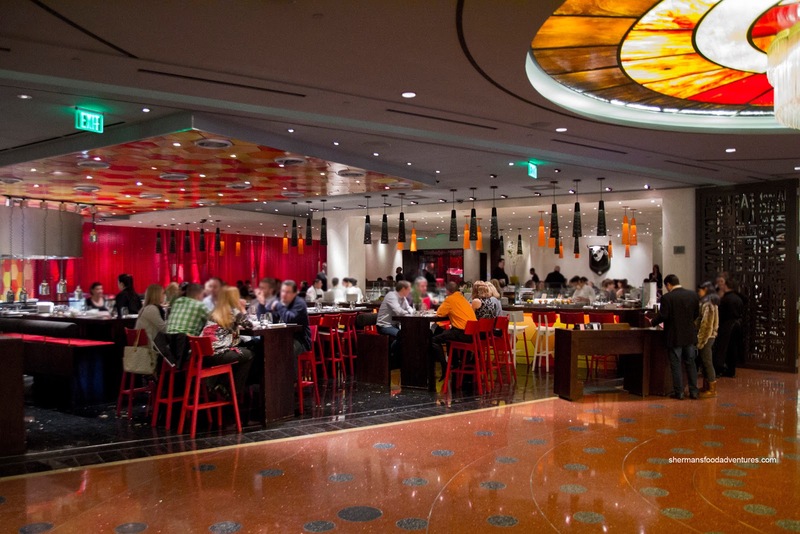 Yes, I do realize we ate at a celebrity chef restaurant on the Strip. Therefore, we shouldn't have had sticker-shock. 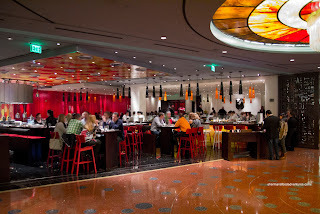 However, even with us conceding that the food was pretty good, the value was just not there. The Automatic adverts that showed up next to your post was humorously ironic. I took a screen capture for you.